Force Factor’s range of supplements has expanded massively in recent years. So much so, that they now boast the likes of brain health, energy, thermogenic, and so many other types of supplements. However, the latest supplement which is soon to be released from this particular company comes in the form of Alpha King Immortal – a spin-off of their original testosterone boosting formula Alpha King. Exclusive to major supplements retailer GNC, Alpha King Immortal forms part of Force Factor’s high-end line of products. This is aptly named the Platinum Series, which also includes other supplements including Swagger, and healthy aging formula Prime Time. But, just what makes Alpha King Immortal different from its predecessor? What makes it stand out from the crowd? Well, if you’d like to find out the answers to each of these questions and more, we suggest you continue reading. The following will be a review of Force Factor Alpha King Immortal. So, without any further ado, it’s time for us here at Supplement Devil to give you the low down. In the following section, we will provide an overview of exactly what is included within Alpha King Immortal and what you can expect if you decide to hit that buy button. 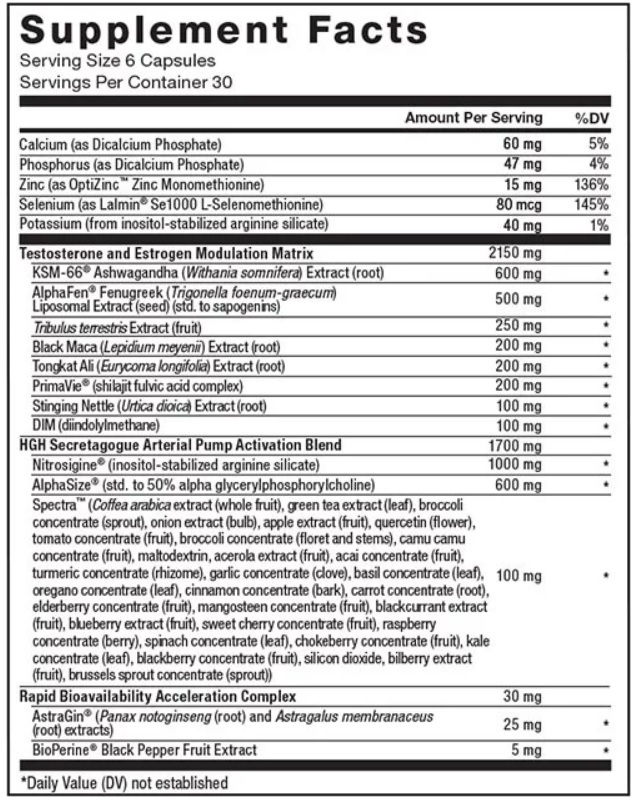 First up, here’s the supplement facts sheet that tells you all about the included ingredients. As you can see, there’s a hefty amount of ingredients included within Alpha King Immortal. In total, there are 13 different ingredients, which all work in combination with each other to boost your testosterone and allow you to get those all-important gains in the gym. The majority of these ingredients, or to be more specific, ten of them, are premium branded features. So, this just goes to show that you’re getting a lot for your money if you decide to purchase the product. However, you’ll find that the serving size is a hefty six capsules, which is far more than many other alternatives out there on the market. This might be a little off-putting to those who seek a convenient way to get their testosterone boosting fix. In spite of this, you’ll find that Force Factor is very transparent when it comes to listing ingredients. This is something we always like to see here at Supplement Devil. After all, this means that you know exactly what ingredients you are putting in your body. In addition to this, an arterial pump blend is also included within Alpha King Immortal. This consists of a gram of Nitrosigine, 600mg of AlphaSize alpha-GPC, and 100mg of the Spectra fruits and greens blend. Having ingredients such as Fenugreek is a great inclusion by Force Factor. This ingredient is proven when it comes to boosting testosterone, as even in small doses, both free and total hormone levels are boosted considerably. Other ingredients such as Zinc will also contribute to increased testosterone levels. As an essential mineral, it’s important to have a fair amount of Zinc in your diet. This is because not consuming enough can lead to declining testosterone levels. You’ll also find that Zinc can directly boost testosterone levels, as well as decreasing aromatization. This is the process in which testosterone is rapidly converted into the female hormone estrogen. What Are The Benefits of Alpha King Immortal? As you will have already gathered by now, Alpha King Immortal is a testosterone boosting product. A wide range of benefits can be had when you consume the product on a regular basis. What are the benefits of Alpha King Immortal? You ask. Well, you’ll find that the impressive list of ingredients all work in combination to help with strength and muscle building. If that’s an area in which you see a need for improvement, you might just find this particular supplement to be the answer to your prayers. Libido and performance can also be enhanced thanks to the included ingredients. This is enhanced even further as it offers total masculine hormone support. So, if you’d like to impress your significant other between the sheets, Alpha King Immortal could well be your savior. Of course, you should always stick to the recommended dosage when it comes to consuming any supplements. This is because consuming in excess can often do more harm than good. So, just be sure to play it safe and stick to the recommended dosage. Otherwise, this could end up having a negative impact on your health and well-being. As with many other things in life, more is not better – particularly when it comes to taking supplements! So, just be sure to stay within the recommended dosage to be on the safe side. It might even be worth taking less than the recommended dosage to begin with. At least then, you can gradually up your dosage to the full six capsules per serving. When Is Alpha King Immortal Released? Alpha King Immortal isn’t available to buy right now. However, you will soon be able to purchase it from the exclusive seller in the next month or so. Therefore, if you’d like to get your hands on it, you will need to keep tabs on the GNC website. The Platinum Series of supplements from Force Factor looks pretty impressive to say the very least. Each of the products in the lineup certainly appears to live up to its name – at least on paper. Alpha King Immortal is certainly no exception. As was mentioned earlier, all that is known about Force Factor’s Alpha King Immortal is that it is due to be released alongside the other supplements in the line up over the next month or so. Those who’d like to get their hands on this supplement will only be able to do so from one place. This is because it is being made available for purchase exclusively with major supplement store GNC. In the meantime, you can find out more information about this upcoming supplement and check out the other supplements in the Force Factor range by paying a visit to the official website. That just about wraps things up for us here at Supplement Devil. As always, be sure to keep an eye out on our website as we give you the low down on all the latest and greatest in the exciting world of supplements. Until next time folks!